Ready to be whisked away to scrapbooking paradise? The Calypso paper packet is colorful and happy, with cute designs like flamingos and pineapples that have us dreaming of slipping off to a tropical oasis. In the “relaxation sensation” of Calypso, today we just want to inspire you with fresh ideas for using Calypso in your scrapbooking. 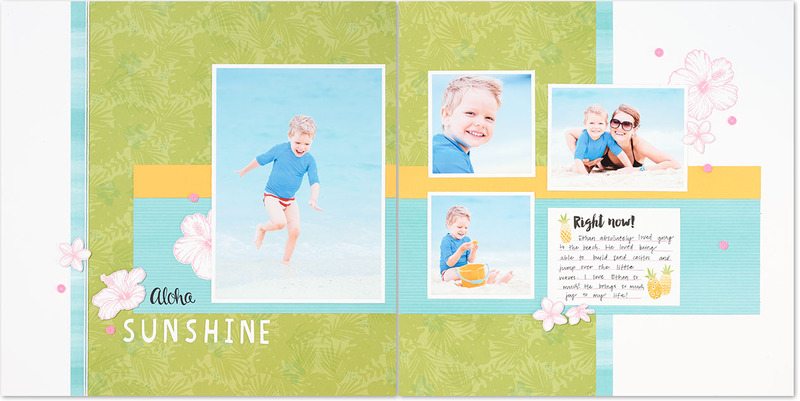 Just like the beautiful beach in these photos, this Calypso layout feels calm and serene. A pocket scrapbooking card, which comes with the paper packet, made for easy, breezy journaling, and a beautiful way to tell the story of the photos. Love the flamingos on this page? You can get your own flock of flamingos for your scrapbook pages with the Tickled Pink stamp set and the coordinating Thin Cuts dies, which make cutting precise shapes for stamping almost effortless. Now we want to see YOUR Calypso layouts! Share them with us by using the hashtag #ctmhcalypso when sharing your artwork on social media. Calypso paper shouts Summer!!!! Love it! !